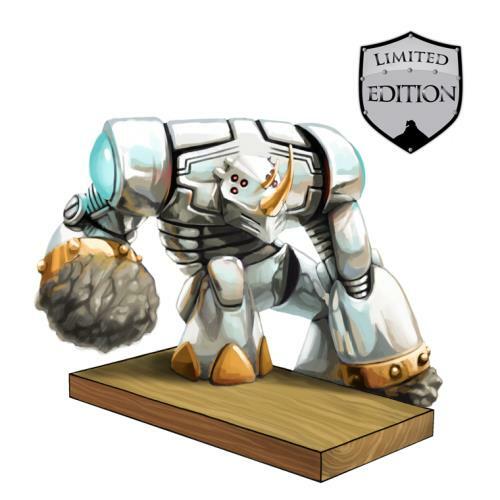 The Chrome RhinoBot is a Limited Edition Physical weapon. This RhinoBot sure packs a punch! Its luxurious look and intricate gold detailing is a great way to hunt with style. The shine of its extraordinarily bright chrome is only surpassed by the shiner it leaves on any mice caught in its path! The Chrome RhinoBot is a Limited Edition weapon and can no longer be acquired by Hunters. It was available for purchase for 3,200,000 gold from Ronza's Traveling Shoppe during her January-February 2012 visit. It refunded for 575,000 gold at the same location. A complete list of RhinoBot weapons can be found here. A complete list of chromed weapons can be found here. 31 January 2012: The Chrome RhinoBot was introduced. This page was last edited on 13 January 2019, at 13:14.